Learn about great riding vacations and horseback rides that recognize the importance of a good glass of wine. Cheers! 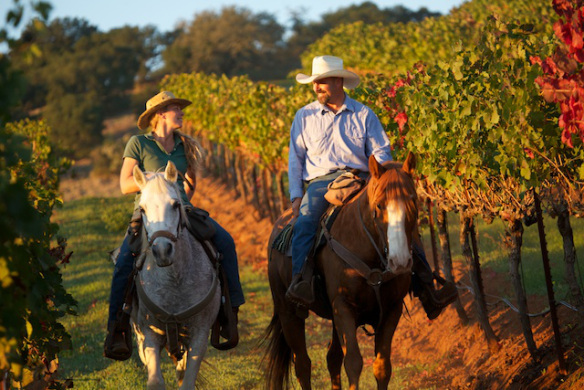 Whether it’s a glass of Pinot Noir or Pinot Grigio, wine lovers will rejoice over these horseback riding tours that make drinking wine their top priority. Get a sense of the hard work that goes into creating a bottle of wine while riding through vineyards, try tasting different varieties at local wineries, or enjoy a glass of red with your gourmet dinner. These four destinations below all have something different to offer the wine enthusiast. 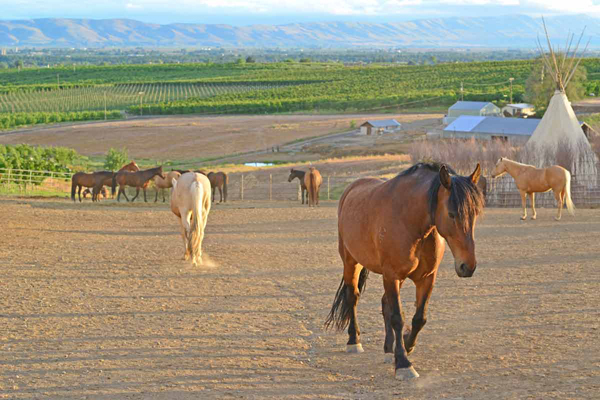 Located in Washington’s Yakima Valley wine country, Cherry Wood Bed Breakfast and Barn is a working farm that offers winery tours on horseback as well as hay wagon winery tours. 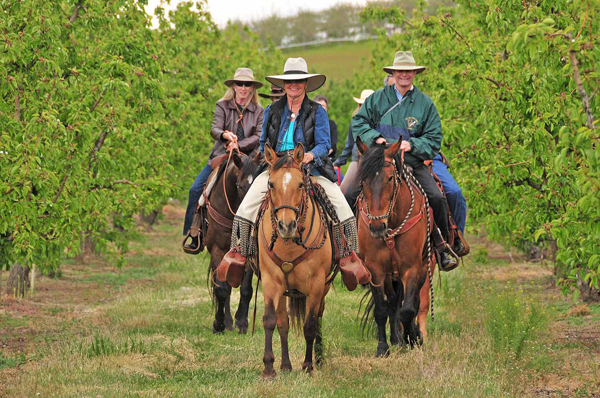 Learn about Cherry Wood’s farming operation as you ride through the surrounding vineyards. The tour includes stops at two wineries plus a gourmet picnic style lunch at Cultura Winery. 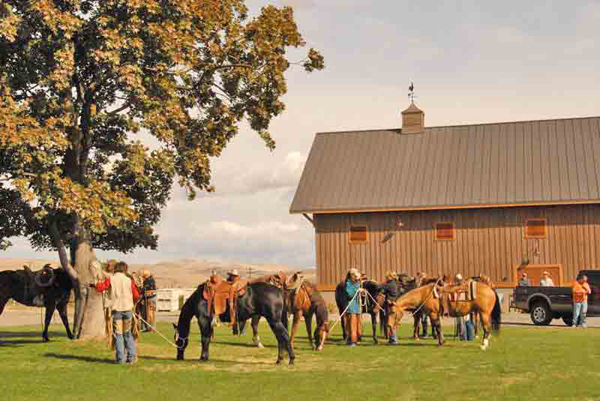 If you prefer to visit more wineries, you can also take a hay wagon winery ride, also known as their Cowboy Limo Tour. This tour includes fruit and cheese samplings, a picnic lunch, and allows you to visit more wineries than you would be able to on horseback. Guests stay in luxurious teepees, for a true glamping experience. In addition to comfy beds, all teepees have barbeque grills, small refrigerators, private bathrooms, and open air showers. Breakfast at the ranch reflects seasonal and local produce, some of which comes right from the farm. Cherry Wood also has a horse rescue program that is supported solely by the wine tours. Horses are rehabilitated, rehomed, and suitable mounts even end up being used on the wine trail. You don’t need to be a guest at the B&B to join in on the winery tours. 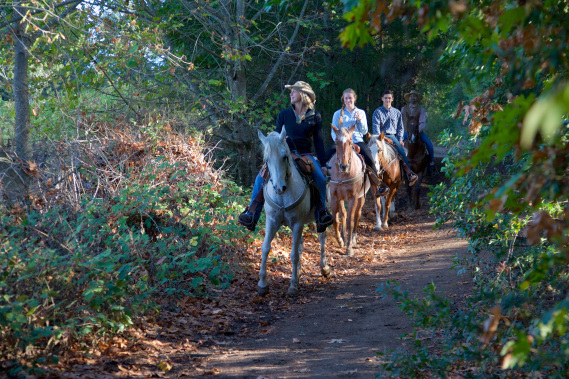 Horseback tours are offered on Friday and Saturday year round and wagon rides run Thursday through Sunday. For a luxury experience, The Lodge & Spa at Brush Creek Ranch boasts an 800-bottle wine cellar and horseback riding in Wyoming’s open range. This historic cattle ranch turned boutique hotel is adjacent to the million-acre Medicine Bow National Forest, offering spectacular vistas. 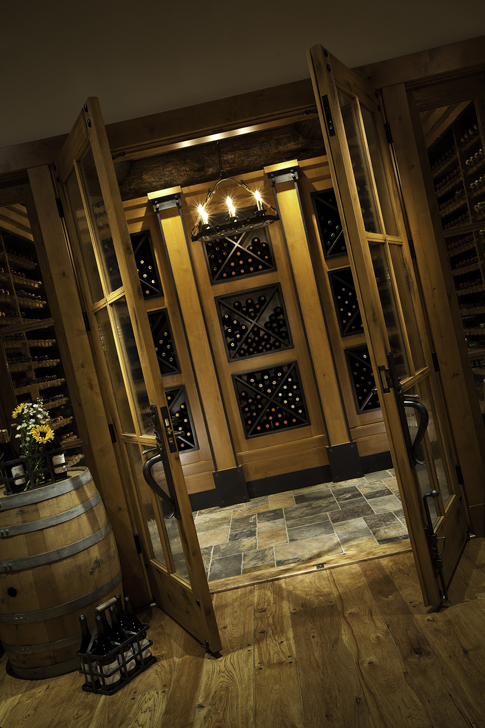 Guests can choose their own wine from the cellar with their gourmet dinner. A large selection of vintages from all over the world are available and are chosen to complement the gourmet dishes created by Chef Collin Meyer. 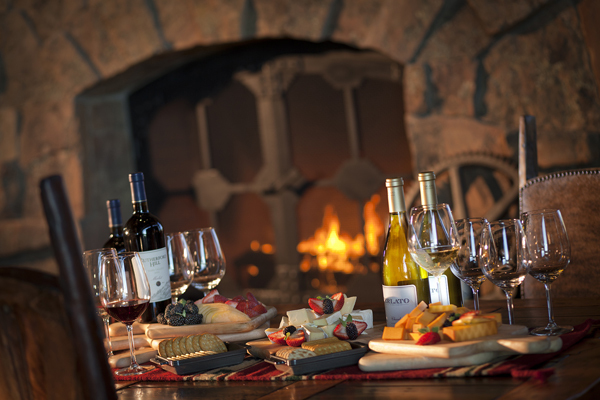 Guests can also take part in a nightly pre-dinner happy hour where a particular wine (and/or cocktail) is featured as well as weekly multi-course wine pairing dinners in the Trailhead Lodge Great Room. 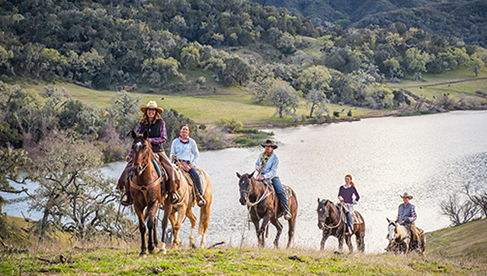 Enjoy the rich history and scenery in California’s famed Sonoma Valley at the 1400-acre Jack London State Historic Park with Triple Creek Horse Outfit. Triple Creek offers guided tours through vineyards and oak and redwood woodland and riders of all abilities are welcome. Admission to the park is $10 per vehicle, which includes admission to the museum and historic buildings located within the park including passes for a Cottage Tour, which was Jack London’s principal home at Beauty Ranch. After the ride, guests are given vouchers for complimentary tastings at Benziger Family Winery and Image Estate Winery. Triple Creek Horse Outfit is open year round, five days a week from April through October, and seven day a week November through March. Call ahead to make reservations. 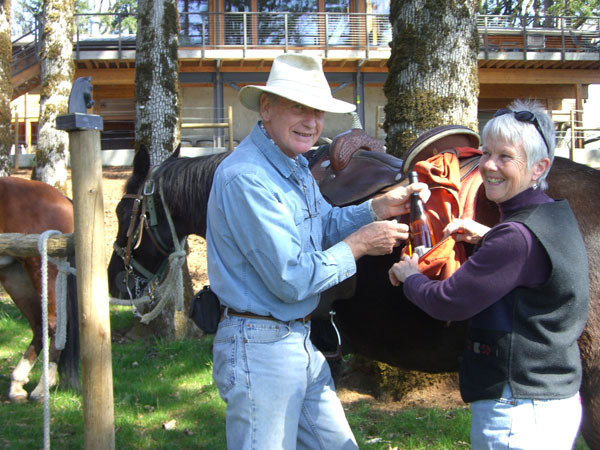 Explore Oregon wine country from the back of a comfortable Tennessee Walking Horse with Equestrian Wine Tours. The two and half-hour tour takes guests through vineyards of the Dundee Hills within the Willamette Valley, stopping at several wineries along the way. For a change of pace, Equestrian Wine Tours also offers carriage rides to winery tastings and is a great option for special occasions. 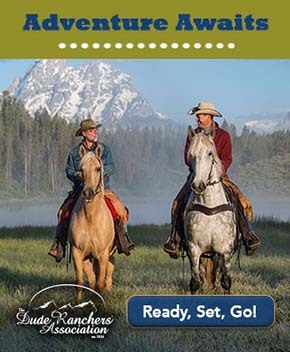 Learn more about horseback riding vacations in the Equitrekking Vacation Guide, Top20Ranches and check out discounts to get you there on Equitrekking Travel Deals.